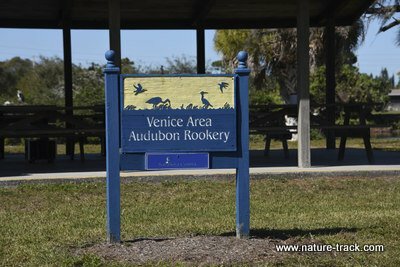 Despite the popularity, we didn't find the Venice Rookery crowded on the day we visited. According to renowned photographer George Lepp, that isn't always the case. 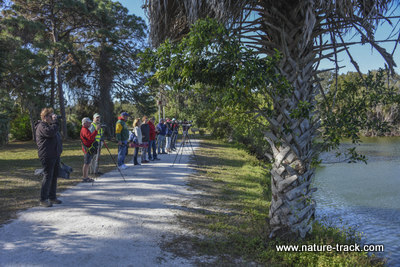 Virtually every birder or bird photographer has heard of the heron and egret rookery at the city of Venice, Florida. 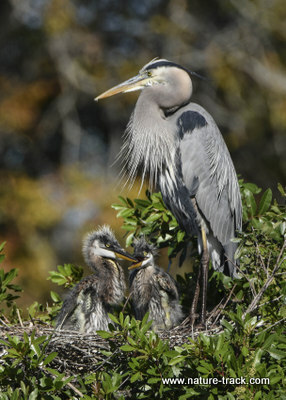 It is photographer George Lepp’s favorite place to photograph birds in all of Florida. 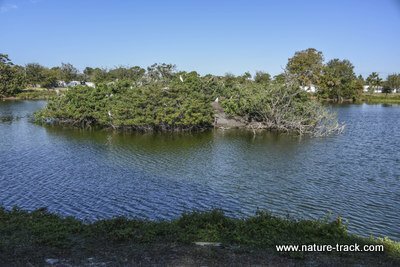 Many of the great photographs of breeding egrets and herons come from here because it is so easy to get to and to photograph at. This little island is the rookery. Hundreds of egrets and herons will communally nest here from December through May. We spent just a few hours there during our trip as we were probably several weeks early for the egret displays. Great blue herons, however, had nests ranging from new construction to chicks almost ready to fledge and they provided some entertainment. This is now an Audubon site and they have a visitor center, and parking very near the pond. This is apparently a relatively new development as Robert Hitchman does not mention either in his Photograph America Newsletter of October, 2005. In fact, he said he had to walk several hundred yards and park alongside a county office building. Additionally, the rookery turn-off is well marked with brown street signs these days. For the popularity of the place, you will likely be surprised at its small size. The pond itself is perhaps an acre in size and there is an island almost in the middle of it. The island houses the rookery and is only about 30 yards from shore. During the busiest season, March through May, there can be a lot of viewers and photographers, but when we were there in late January, there were only about a dozen at any given time. There is usually an Audubon volunteer there as well to answer questions and to point out cool things. For photographers, morning light was great and Robert Hitchman says that there is great cross-light in the afternoon. Middle of the day is a good time to go to the visitor center. There isn’t a lot there but the hosts are friendly and informative. 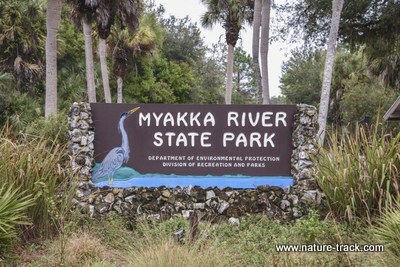 We visited Myakka River State Park twice, camping there for a total of three nights. 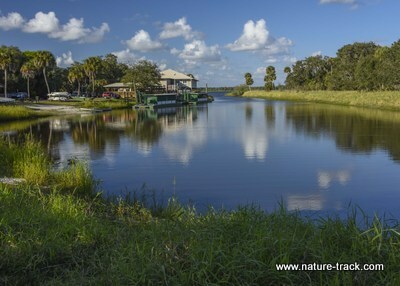 Myakka River is just outside the town of Sarasota. Our first visit was just before we headed south to the Everglades and the Keys. We liked the place and so Cathy got online with Reserve America and picked up a campsite reservation cancellation. The campground cost $36/night and there is a $6 reservation fee, but campers do not have to pay the $6 entrance fee, saving us $12 for our first stay. 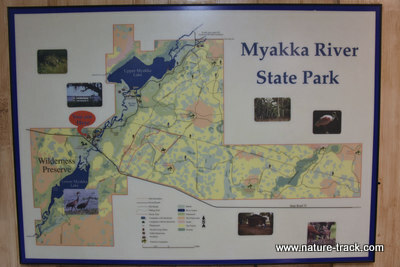 There is a lot to see and do at Myakka. There are several trails to walk and one includes a tower that stands well above the canopy and includes a canopy walk about 30 feet above ground. 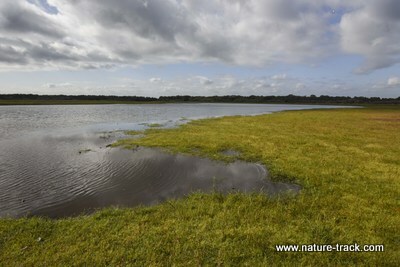 There is a large lake, Upper Myakka Lake, that attracts a lot of birds. From the boardwalk overview, we could see great blue herons, black-necked stilts, willets, sandhill cranes, little blue herons, great egrets, limpkins, American white pelicans, snowy egrets, bald eagles, harriers, glossy ibis, palm warblers, crows, grackles, sandpipers, common yellowthroats, and a few I couldn’t identify. 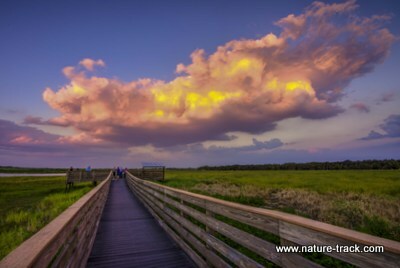 From this boardwalk, we could watch large numbers of birds as they foraged in Myakka Lake. 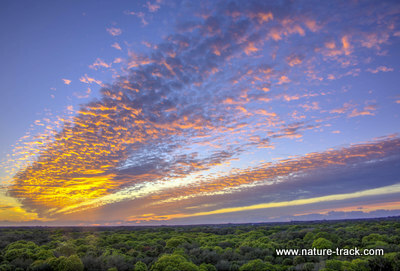 One evening, the sunset from the tower was spectacular. We didn't get many great sunsets in Florida, but this one made up for it. There is one long hike (2.5 miles one way), called Deep Hole, that requires a permit. Only 30 people a day are allowed to go there and you have to pick up the permit on the day you want to go. When it is busy, these permits can all be gone by 0830. It is a pretty hike, flat as a pool table, through what they call prairie and slash pine forest. Slash pines are really cool trees with big open tops. I wish one would grow in my backyard. 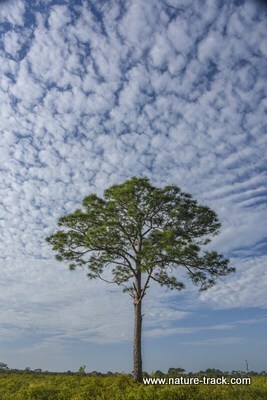 Slash Pine is kind of an ugly or at least utilitarian name for such awesome trees. This is the Deep Hole area. Deep Hole is actually behind me and is a relatively small spot. There is a resort area (resort is a little too strong, but there is a concession there) on the lake where you can grab a hamburger and catch a ride on a boat out into the lake. They advertise this as an airboat ride, but it isn’t an airboat like I think of, with the airplane propeller on back. The ones we saw moved pretty slowly. The ride is about $28 each so we didn’t do it and I don’t regret it at all. It kind of looked lame to me. This resort area can get pretty busy, even on a weekday in February. The parking lot is quite large and was half full when we were there. 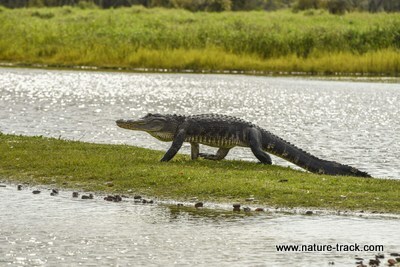 Myakka River and Lake are full of alligators. We saw about 25 at Deep Hole and another half dozen at the park road bridge. Despite their languid looks, we gave them wide berth. It is said that in a short burst they can outrun a human! 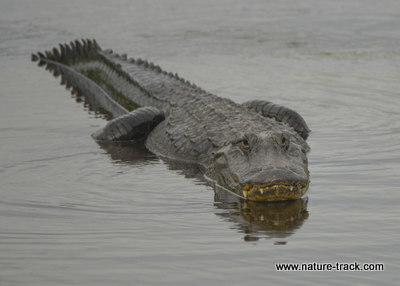 We really enjoyed Myakka River State Park. If we ever tow our trailer to Florida, we hope to spend four or five nights there. We will have to plan well in advance though. Other campers are making reservations nine to eleven months in advance.